I feel like in my house Paw Patrol is always on the television for my son! When I first found out that toys were now available from Spin Master my only question was "where can I get them?!" 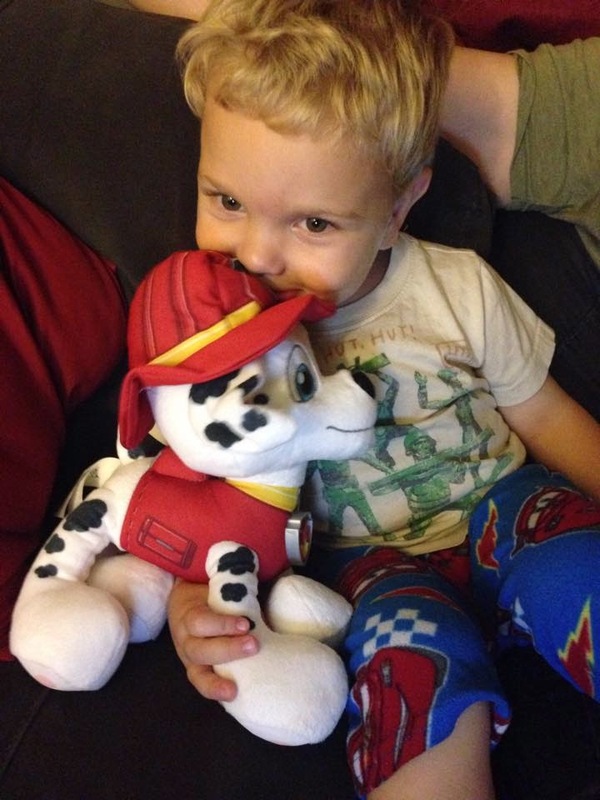 Paw Patrol toys are perfect for any every little fan of the show! Keep reading to learn why we chose Paw Patrol Real Talking Pets and Action Packs as some of our top holiday toy picks of 2014! Paw Patrol promises to rush to the rescue with wagging tails to save your from any situation and you can now bring these adorable pups to your home! With these Paw Patrol toys your child can bring rescue missions to life. No job is too big, and no pup is too small to go on a Paw Patrol Adventure! One way that these pups can join your home is in a soft plush version that talks! Each of these pups are 8 inches, made of premium plush materials so that they are soft to the touch! These talking pets come in 7 characters including Marshall, Rubble, Chase, Skye, Rocky, Zuma, and Ryder so every little one can pick their favorite! My son loves his talking Marshall! He is constantly carrying him around and loves to snuggle up with him at night for bed time! You can also welcome these pups into your home with Action Packs! Each Action Pack comes with a pup and an official action badge! Action Packs are available in Chase, Marshall, Skye, Rocky, Zuma, and Rubble! We received the Rubble Action Pack and the Skye Action Pack to play with and review! My son loves playing with these action pups! He loves that when he pushes Rubble's dog tag his Pup Pack transforms into a heavy lifting digger just like in the show! He loves pretending that Rubble is doing construction! He also loves to push Skye's dog tag to transform her Pup Pack into highflying wings so that he can make her fly around! With these pups he is able to have lots of rescue missions! Visit Spin Master's Website HERE! "Like" Spin Master" on Facebook! "Follow" Spin Master on Twitter!